Hamiet Bluiett, seen here performing at the New Orleans Jazz & Heritage Festival in 2007, died Thursday at 78. For more than four decades, Hamiet Bluiett found a way to combine the avant-garde with traditional jazz. Along the way, he redefined the role of the baritone saxophone, and co-founded one of the most successful groups in modern jazz: The World Saxophone Quartet. Bluiett died Thursday due to complications from a series of strokes he suffered over the past several years, his sister Karen Ratliff told NPR. He was 78 years old. His granddaughter, Anaya Bluiett, announced on social media that his funeral will be held next Friday in Brooklyn, Ill. The World Saxophone Quartet changed the sound of jazz from the moment it made its debut in 1976. No bass. No drums. No piano. Just four saxophones: the late Julius Hemphill playing alto, Oliver Lake on alto and soprano, David Murray playing tenor, and Hamiet Bluiett playing clarinet and baritone sax. When the World Saxophone Quartet started out, free jazz was flourishing in New York's downtown loft scene. The four musicians in the group were all improvising at the same time – without playing any unifying melody or rhythm. In 2010, Hamiet Bluiett told NPR he argued for more structure. "I said, 'Wait, this ain't making sense. I don't like this. Because we play a tune, let me stick to what's on the paper.' I would see what's on the paper, and make a bass line out of it — make up some kind of line using the tunes." At a quartet rehearsal in 1979, Bluiett said the musicians had to make an effort to connect with listeners — but the audience had to make an effort, too. "Get all the other stuff out of your mind, all of the hang-ups, and just listen," Bluiett said. "If you like it, cool. If you don't like it, good too. If you hate it, great. If you love it, even better. Now if you leave the concert and don't have no feeling, then something is wrong. That's when we made a mistake." 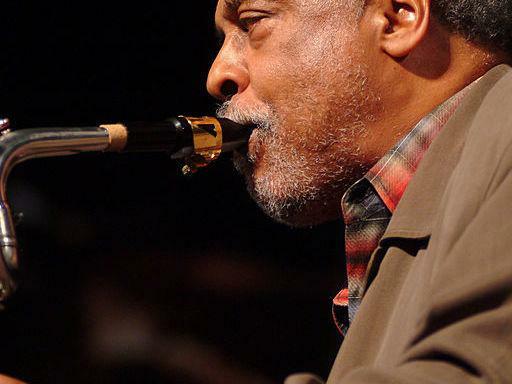 Hamiet Bluiett was born on September 16, 1940, in St. Louis. He studied piano, trumpet and clarinet as a child. At the University of Southern Illinois, he picked up the baritone saxophone. He said his notion of what the instrument could do was changed forever when he heard the big sound of Harry Carney with Duke Ellington's band. Jazz critic Stanley Crouch says Hamiet Bluiett forged his own big sound on the baritone. "He had worked on playing the saxophone until he had an enormous tone that did not just sound loud," Crouch notes. "And the way that Bluiett described Harry Carney's playing — he basically was telling you how he wanted to play: 'I want to be able to play that very subtle, pretty sound, way at the top of the horn, if necessary. I want to play a foghorn-like low note. And if they want a note to sound like a chain beat on a floor, I can do that, too.'" Hamiet Bluiett made music that moved people — and that's all he cared about. "We were playing in the Brooklyn Botanical Garden," Bluiett told NPR in 2010. This guy came, he was in a wheelchair. So he was in the wheelchair section right near the band. And he was sitting there, you know, he was kinda like crying. He grabbed me and pulled me down. He said, 'Man, I've been in this chair for so long, I got to the point, you know, where I relegated myself to be into the chair. And I was satisfied. You made me want to go back up and dance.' That was the biggest compliment I ever had in my life." Bluiett said he never planned his career: It all happened because he was open enough to let it keep happening. For more than four decades, Hamiet Bluiett found a way to combine the avant-garde with traditional jazz. Along the way, he redefined the role of the baritone saxophone and co-founded one of the most successful groups in modern jazz, the World Saxophone Quartet. Bluiett died Thursday in St. Louis of complications following a series of strokes. He was 78 years old. Tom Vitale has this appreciation. TOM VITALE, BYLINE: The World Saxophone Quartet changed the sound of jazz from the moment it made its debut in 1976. VITALE: No bass, no drums, no piano - just four saxophones, the late Julius Hemphill playing alto, Oliver Lake alto and soprano, David Murray tenor and Hamiet Bluiett clarinet and baritone sax. VITALE: When the World Saxophone Quartet started out, free jazz was flourishing in New York's downtown lofts. So the four musicians in the group were all improvising at the same time without playing any unifying melody or rhythm. In 2010, Hamiet Bluiett told me he argued for more structure. HAMIET BLUIETT: So it isn't even making sense. I don't like this. Let me stick to what's on the paper. So I would take what was on the paper and make a baseline out of it, make up some kind of line, using the tunes. VITALE: At a quartet rehearsal in 1979, Bluiett said the musicians had to make an effort to connect with the listeners, but the audience had to make an effort, too. BLUIETT: Get all of the other stuff you've got out of your mind - all the hang-ups, all the information - and just listen. If you like it, cool. If you don't like it, good, too. If you hate it, great. If you love it, even better. Now, if you leave the concert, and you don't have no feeling, then something is wrong. That's when we've made a mistake. VITALE: Hamiet Bluiett was born on September 16, 1940. He studied piano, trumpet and clarinet as a child. At the University of Southern Illinois, he picked up the baritone saxophone. He said his notion of what the instrument could do was changed forever when he heard the big sound of Harry Carney with Duke Ellington's band. Jazz critic Stanley Crouch says Hamiet Bluiett forged his own big sound on the baritone. STANLEY CROUCH: He had worked on playing the saxophone until he had an enormous tone that did not just sound loud. And the way that Bluiett described Harry Carney's playing - he basically was telling you how he wanted to play. I want to be able to play that very subtle, pretty sound way at the top of the horn if necessary. I want to play a foghorn-like low note. If they want a note to sound like a chain being beat on the floor, I can do that, too. VITALE: Hamiet Bluiett made music that moved people, and that's all he cared about. BLUIETT: We were playing in the Brooklyn Botanical Garden. This guy came. He was in a wheelchair, so he was in the wheelchair section, which is right near the band. And he was sitting, and he was kind of - you know, like crying. He grabbed me and pulled me down. He said, man, I've been in this chair for so long, I had got to the point I had relegated myself to be into the chair, and I was satisfied. You made me want to go back up and dance. That was the biggest compliment I've ever had in my life. VITALE: Hamiet Bluiett said he never planned his career. It all happened because he was open enough to let it keep happening. For NPR News, I'm Tom Vitale in New York. Transcript provided by NPR, Copyright NPR.